Q? I’m meeting next week with hotel staff for our “pre-reunion” meeting. What questions should I be asking? In particular, what do I need to do to make sure our Sunday night dinner goes well? This is the “big” event when everyone will be together, and I want to make sure everything is perfect! A! This is a great question. 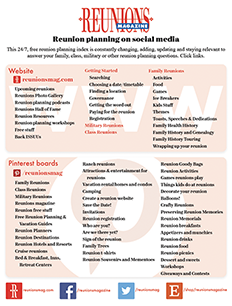 Typically, the “dress up” luncheon or dinner is one of the highlights of any reunion. You’re to be commended for paying extra attention to all the details … this will be something everyone will remember! For starters, you should have already worked out your menu with your hotel catering representative, so you’ll know exactly what is being served. If the “event order” for your meal is vague about certain items (such as “Chef’s choice of dessert”), ask to have these clarified. If anyone in your group has a special dietary need, food restriction, or allergy, now is the time to let the catering representative know, NOT the day the meal is being served. Work out details for how service staff will know who is to receive a special meal. If you’re having a special décor scheme (say, table linens in specific colors or special centerpieces), review these details. Likewise, if you’re going to be providing programs, seating cards, or place favors, review how and when these will be delivered to the hotel, and who is responsible for putting them at each place setting. Some hotels will do this for you; others will ask you to do it yourself. Many hotels have centerpieces and décor on hand that you may be able to use at no charge or for a nominal fee. Ask to see these set up on a sample table so you’ll know exactly how everything will look for your event. If you’re serving alcohol, review how it will be served. Are you having a cash bar? A hosted bar? Wine service only? Review the scheduled time for your program (someone speaking to or performing for the group). As a general rule, you won’t want to have a course being served or dishes being cleared while someone is trying to speak! Ask to meet (and get to know) the banquet captain or maitre d’ who will be overseeing your meal. He or she will have the ultimate responsibility for making sure everything goes smoothly during your event. If you’re having a stage and/or dance floor set up for a band, a disc jockey or a talent show, review the size and location of these in the room. Review how early (before the event) the band/disc jockey/talent show participants will have access to the room for set-up and rehearsal. Likewise, review your need for electrical outlets, as well as for any audio-visual equipment the hotel may be providing. For example, if you want the stage set up on the side of the room where there are no electrical outlets for the disc jockey, you’re got problems! If people will be speaking or telling stories, and the group is larger than 40 or so people, you’ll definitely want to have a microphone so that everyone in the room (including those who may be hard of hearing) can hear clearly. Ask whether any other groups will be holding events in the hotel at the same time as yours. If you are conducting a solemn service of remembrance, or asking your patriarch or matriarch to speak at your meal, you don’t want to be drowned out by a band playing at full volume in the next room. If you’re going to be taking home leftovers or donating them to a local charity, review the details for this. Ask about any unopened bottles of wine you may have purchased. Some hotels will allow you to do this, others will not. In many cases, this will be governed by state and local regulations. And finally, be sure everyone understands who is signing the banquet check at the end of the event, and who is allowed to make any changes or additions to the menu during the course of your meal. If you don’t tell the hotel otherwise, they’ll gladly bring one of your attendees a second steak if asked to do so, and it will end up on your bill! Hope that you have a marvelous event!